My plan is to share a bunch of case studies on this site, all of which are to be well documented. It's not that non-documented case studies aren't valuable, but just less trustworthy. Generally speaking, using tools like that to obfuscate your links isn't something that we'd worry about. That said, it doesn't change anything from our point of view: Our algorithms expect unique, compelling, and high-quality content on your site. Whether you're an affiliate or not, it's important to us that users are able to find what they're looking for on your site - otherwise they might be better served by having the final destination in our search results. It doesn't matter so much that a link is an affiliate link, or where the ultimate target is (and with that in mind, it doesn't provide any additional "SEO" benefit to hide that from search engines), it's really much more about the additional value that your pages add. So what's the verdict on this? I am not saying, Jon, doesn't have reason to promote this, nor that the plugin doesn't work as stated on the sales page. It does hide the links as described on the sales page. But based on my personal experience with this, I didn't see any SERP improvement; and I tested this on a lot of affiliate links. Lots of factors could affect this, that we don't know about. Keep in mind my test was done on one website, only. Site age, type of affiliate links, number of affiliate links, keywords targeted and a thousand other aspects could affect the outcome of this. I do however, think, my test should be food for thoughts; specially for potential elf link clients. 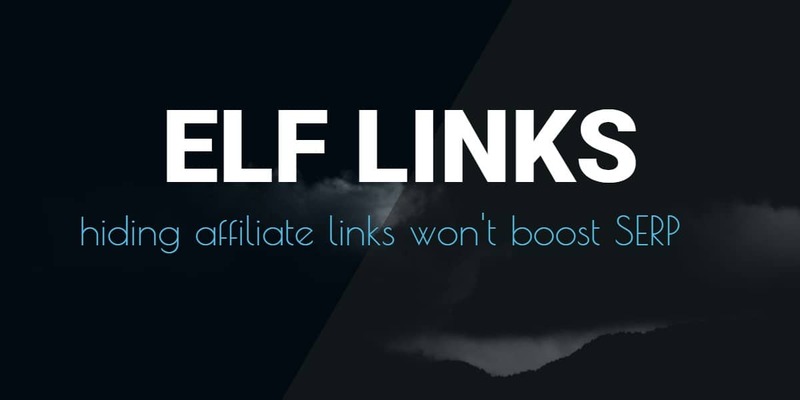 You should also remember that if you have a lot of affiliate links, replacing them with elf links is a long and mundane task (and the same is true for going back). Why stick to using this on some sites, and not all of them? How well did you test this and how certain are you, that elf links actually contribute to better SERP’s? I honestly believe this won't do anything good (nor bad) for your SERP's, unless you run a churn and burn kind of site more affiliate links than unique content. If you have tested Elf Link I would love to hear about your experience. Did this boost your SERPs or not?